Beginning on the east side of Scholls Ferry Road nearly opposite what is now Raleighwood Lane, it travels south past what is now a [Safeway] shopping center to Vermont, west to the Oregon Episcopal School and south to the old railroad line which is on the southern border of the Portland Golf Club. It continues west along the old rail line almost to the point where it again meets with Scholls Ferry Road. The District’s western boundaries are west of Arrowwood Drive and extend north almost to the Beaverton-Hillsdale Highway. 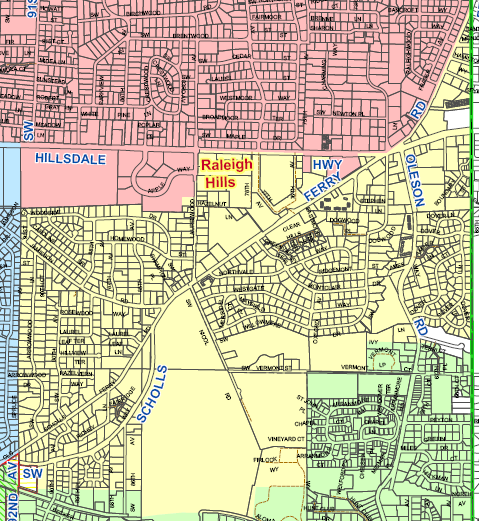 If you are not sure whether you reside in the boundaries of Raleigh Water District, please contact the district office and we can check your address. The City of Beaverton website also provides larger and more detailed Water Service Area maps in PDF format which allow you to zoom in to find individual streets.